Well today went as well as it could with Braden being re-intubated. The good news is that his echocardiogram came back a-okay and his cultures have been negative so far (no infection). I guess those darn lungs of his just have to get the hang of the new pumping system in his heart. The doctor is going to give him a day or two of rest and nutrition before they try extubation round 3. PS...I must comment on the pic that Rich posted. He's just the cutest damn thing I ever layed eyes on. We literally sit there for hours watching his every move....putting a smile on our face when he purses his lips, smiles in his sleep, or opens his eyes. He swells our heart with so much love and pride. Those of you that plan on visiting us during our stay can plan on seeing this. Except now he has the breathing tube back in for the next couple of days. I know this may be a little shocking with all the wires and machines, but this is all we have really known. I think it will be weird to see him without all this stuff someday. It will be great though. I will be heading up to MCH tomorrow afternoon when school is out. We have a 3 day weekend because of Labor Day. It was good to get back to work, but extremely hard to be away from Steph and Braden today. I would like to thank everyone at Harvard for offering so much help and for being so understanding of the situation and long road that the 3 of face. It is very comforting to know that so many people are there for you and your family when an unexpected challenge like this comes up. Thank you so much. Steph will be posting an update tonight with the latest news. Well, our little trooper has definitely been our human yo-yo. He does well for a few hours with breathing, then he struggles for a few more. The neonatal intensivist we've been working with was up all night thinking of our little guy trying to come up with a reason behind his breathing troubles. With all of the testing they've done, she seems to think his little lungs just need time to catch up with all of the re-routing of his blood flow....unfortunately, it's taking more time than we expected. They will be doing another echo today to rule out anything with the heart that's causing this....so far, everything looks great with the heart, but they still have to rule it out. They will then do another blood culture to make sure there's no infection. The culture they did the other day was negative, but they need to still rule out infection in case something has changed in the last 24 hours. Unfortunately, they needed to re-intubate as I write. The only positive side of this is that they can feed him while he's intubated to "beef" him up for extubation round 3....hopefully the famous quote, "Third time's a charm" will be his motto. Rich is back to work today.....I do have to share him with the students and staff at HHS :-) We've been in constant contact....I know it's harder for him to be away than for me to be here without him. Something I forgot to mention about the visiting situation is that if you or anyone in your family is sick, please don't come.....I'm sure you're all aware of this, but I did have to mention it....PICU rules! Thank you for continuing to lift our spirits everyday with the blog comments, e-mails, and prayers. Our aching hearts are touched with the amount of love and support that surrounds us each day. One week ago today was Braden's surgery....hard to believe! Today, the doctors are trying to figure out the best "recipe" for Braden to be comfortable (but not sedated); peeing off excess fluid (but not too much or he'll dehydrate); independent breathing (with a little support)....uggh! I know that this is "typical".....every kid is different...it's just frustrating when they have to give him a "dash" of this and a dose of that....I just wish we could breathe for him. He's having another X-ray (as I write) to make sure those lil' lungs are still cooperating. He's been crying every now and again which is a good thing....music to our ears :-) Rich and I both got to hold him today.....a feeling I can't even begin to describe. Rich left for home a bit ago...it's just me and Ronald until Friday evening. Speaking of Ronald.....the Ronald McDonald house is awesome. Volunteers come in on Wed. and Thurs. nights and cook dinner for everyone. Italian style dinner tonight.....much better than the cafeteria food (and my "home" cooking). They definitely make it your home away from home. Starting tomorrow, we'll start to take visitors. I think the best way to do this is to e-mail our petska32@yahoo.com if you're interested in visiting. This way we can give you directions if needed and stagger everyone so we can "share" Braden (there's only 4 people at a time allowed in his PICU room). Well, I'm going to head on back now for night duty. Thanks for your continued support and prayers. Please continue to keep us in your prayers as Braden fights to breathe WELL on his own. Braden got his tube out this morning and Steph got to hold him again. He is maintaining his breathing and will be receiving regular treatments. This will keep his lungs inflated, and hopefully not have to get the tube back in again. Overall we and Braden have had a rough day. He had a PICC line put into his thigh that runs through some vessels to his groin area to dispense medicine etc. He is now running a temp. which could me infection, so now he is on antibiotics again. He hates the breathing tube and fights and kicks and tries to scream every time that he gets a treatment of any kind. Through all of this the doctor's aren't concerned. Good news is he didn't have to get the chest drain tubes put back in and the breathing tube could come out tomorrow morning again, seems his lungs are inflated again and doing well. Just a lot of little things causing frustration for Steph and I today. When we look at the big picture though, he has done an amazing job considering he had a major heart surgery less than a week ago. Even with today's setback he is still ahead of schedule according to what we have been told. Gotta run, Ronald needs the fryer cleaned. We got a phone call this morning that Braden had to be re-intubated. His upper right lobe of his lung was collapsed all day yesterday and they tried like hell to get it to open up. They had to turn him on his left side for most of the day yesterday and then that lung decided to konk out. Re-intubation is the only thing right now to get those lungs to inflate. They are planning to extubate again tomorrow.....hopefully those little lungs of his will cooperate a little better. We'll keep you posted on how things go today. He also had a little oozing out of his incision....they are keeping an eye on it. They're giving him some antibiotics just in case there may be an infection. Please keep us in your prayers today as our little fighter needs some extra support. .....And happy it has been! We have finally been able to hold our little man today :-) I can't even begin to describe what an awesome feeling it is to FINALLY be able to hold the precious baby we've only been able to look at and touch for over a week. With such a rough night with withdrawls and shallow breathing, Rich and I were reluctant to leave Braden last night. Much to our surprise, when we got to the hospital this morning, they had already removed his three chest tubes and catheter (sp?). Removing the chest tubes and continuing some breathing treatments have really helped Braden's lungs open up. We even heard him cry today.....something I never knew I'd wish and pray to hear. They will hopefully be able to start feeding him today. Unfortunately, the feeding part isn't as easy as it sounds. Since Braden has had the breathing tube in and has had constant suctioning, he relates anything in his mouth as negative stimuli. They will start the feeding through a tube in his nose and then they will begin certain techniques to help him associate oral stimuli with fullness in his belly. I want to comment on Rich's blog last night when he mentioned our strength through all of this. I actually owe much of my strength to him. He reassures me that everything that's going on is "typical" with the recovery process; he's my navigator when walking through the hospital (it's like a city within a building); he has been my brain when I can no longer think; he has dried my tears and washed away my fears. I am so blessed to have Rich by my side through all of this. I want to continue to thank all of you for your continued support, love, and prayers. We are blown away with the amount of prayers that God has been receiving in the name of Braden and his recovery. As much as you love our updates, we look forward to reading the comments and our e-mails. They continue to bring us joy each day. Big step today. He passed his test without the breathing machine and had the tube removed about 2pm or so today. The scary part of today has been his withdrawals from the Fentynol drug for sedation. He had the shakes on and off today which was hard to watch. The respiratory therapist comes in and helps him take some deep breaths about every 2 hours. He uses this little mask that pumps some big puffs of air into his lungs. With the trauma that has occurred to his chest and the drain tubes that are still in there he wants to take short, quick breaths all the time. Steph and I are at the RMH right now for dinner before we head back for the night shift. Thanks for all the emails and posts that you continue to put up and send to us. A lot of you have talked about how strong we have been through this trying time. This has been my mindset since we have received the devastating news last Sat. night, we have to be strong or quit, there are no other choices right now. Sure you are just absolutely crushed when you hear that your son basically has half a heart, and phrases like "multiple surgeries, relatively normal life, and complications." Sure we draw strength from each other, we always have and will. I ask myself a lot, "How can I not be strong for my little man, when he is so tough day in and day out?" It is so amazing to see this little 8 lbs person be so resilient and tough. When he is like that, how can you quit on him, or not be 110% tough in return for him, and be in his corner and fight right along side him? I know that everyone that reads this would do exactly the same as we are, you would be strong and you would fight too. I know you would and some of you have already. I don't think Steph and I are superstrong people. We just want our boy to get better and come home and live that "relatively normal life." We would be happy with that. Things are going very well still. Braden is going through what is called his extubation test right now. What this means is that the breathing machine is turned off and they see how he does without this safety net. He has done all of the breathing except 5 an hour for more than a day now. They think that he will be fine without the machine. Once he wakes up a little more he will be ready to get the tube out. This would be a big milestone like I mentioned before, and get him one step closer to eating and coming home. Steph and I spent our first night at Ronald McDonald's last night. It is right across the street, and now that we are in, we can stay as long as we need to stay. It is really nice, and they have everything you need there. It is an amazing place and so helpful for people in our position. We have also agreed to participate in a scientific study that is being conducted here in collaboration with other major medical centers around the country. The researchers are looking at genetic possibilities as well as environmental factors. We will be giving blood that they will extract DNA from for the research. We also filled out a huge questionnaire on our family medical history which is a huge part of what they look at. They have no idea what causes things like this to happen, but maybe we can be a little part of the solution some day. Things are still maintaining. The doctors were talking about removing his breathing tube this morning, but decided not to because he was still pretty sleepy. They are thinking that will be tomorrow which is still ahead of schedule. In terms of visitors we are thinking that maybe after the weekend people could come up and see Braden. He should have a majority of his tubes out by Sunday night and a lot of his swelling should be down by then. We will let you know. Thanks. The doctors were in to check on him and are happy with the lack of swelling that he has in his chest and abdomen. Grandpa Greg and Auntie Marci made it down here this afternoon from the U.P. It was good to see them and for them to be here for us and Braden. The paralyzing drug is starting to wear off and he is starting to wiggle around a bit, and move his eyes when you talk to him. They want him to be still pretty sedated through tonite and most of tomorrow. There is also talk of taking out his breathing tube maybe as early as Sunday, which is ahead of schedule again. When the tube comes out, the hard work begins. Braden will have to be able to eat before we can take him home. The sooner he gets his eating down the sooner he comes home, hence the 3-5 weeks time frame. He will have therapists working with him to teach him what eating and swallowing is again. Being that he hasn't eaten ever, they say that he has "forgotten" those natural instincts. So when we get through the weekend maybe they can get started on the eating. Anyways he is very stable right now and Steph and I are discussing coming home tonight to sleep in our own bed. Which would be nice, no offense to Extended Stay America Hotel, but there is no place like home, that's for sure. Plus my back went out on me this morning, so I have to pay Dr. Mike a visit to get fixed up. Thanks for all the support and prayers it has been a huge help through all of this. Our little fighter continued his ahead of pace healing through the night. He is roughly a day ahead of schedule. We just went into see him about 20 minutes ago after the doctors spent this morning exploring inside his chest (for leaks and clots) and closing it up for the first time since surgery. His next big step will be getting his breathing tube taken out. With his chest closed up now we are still within that 48 hours post-op window, so we have our fingers crossed for the rest of the day. Please keep him in your prayers that his progress continues. Thank you to everyone that attended last nights prayer service in Munising. Thank you for all your love, support, and prayers. Braden has had a very good day. He is draining very well and the doctor said that they may close his chest tomorrow. They have to leave the chest open after a surgery like this so the swelling doesn't put pressure on the heart and lungs. He has a clear plastic patch over the hole in his chest that you can see through. Today went about as good as it could. Sorry I wasn't on the blog to much today, it really flew. Spent a lot of time filling out questionaires. Steph and I are going to participate in a genetic research study to help other people out in the future. They also look at environment factors of where you live, etc. As the knot in my stomach loosens, I just want to say how amazed I am at the strength Rich and I have found throughout all of this. I truly believe that God blessed us with our little angel knowing that we would find the strength in our faith, in each other, and in all of you to help our little man fight like a champ. Reading the comments and e-mails you write bring smiles to our faces, tears to our eyes, and joy throughout the day. For those of you who are in the Munising area, Pastor Lynn is putting together a prayer service this evening at the Eden Lutheran Church at 7:00pm for Braden. Thank you Pastor for putting this together. My dad and sister will be in attendance.....my mom is still down here with us. We will probably post later this afternoon/evening. Thanks again for all of your positive thoughts and prayers. Post operation has gone very well for our little guy. They have dropped some of the blood pressure meds already because his heart is working at a higher than expected level for being so soon after the damage of the surgery. They have also dropped the level of the breathing tube a bit, because he is doing some of the breathing on his own. He has to just keep fighting through today and tomorrow and doctors say then he is out of the high risk post-op zone. Today is his 1 week birthday, what a first week, huh? I will post a few more times throughout the day. Hi to all at HHS also on their first day of school, trust me I wish I was there and everything was normal in life again. Braden just came out of surgery and we were able to see him as they wheeled him to the PICU for recovery. It was as if he had his own little parade as they wheeled him by. We will soon get to meet with the surgeon (Dr. Tweddle) to discuss how everything went today, etc. Thank you, thank you, thank you for all of your prayers throughout the day. Braden is a very lucky boy to have so many people who care about him. God was definitely with him (and us) today :-) Ironically, today was Braden's due date......we look at today as his "re-birth." Please keep Braden in your prayers as these next 48 hours are very crutial. The success of the surgery will all depend on how well he recovers in these next few days ahead. We pray our little man who is so strong and brave (having just endured over 10hrs of surgery) will get through this next week with no complications. Love to you all. Thanks to all of you for what are doing to help us fight for Braden....the power of prayer is amazing. Just received a report the doctors are trying to fix up all the tiny little leaks around where they placed the gortex and modified his aorta. This is a normal part of the procedure, still going great. The doctors are just about done with the placement of the shunt. The reports are that he is doing well and everything in terms of vitals and stats are where they need to be. 3 hours in and everything is going well. Right now he is on a heart and lung bypass machine. They are currently placing the shunt from his right ventricle to his lungs. The shunt is a piece of Gortex tubing that will reroute his bloodflow and help with circulation. He was taken away at about 830 this morning. We had a great morning with him before he had to go. He was awake and looking at us and squirming around. He had the window room on the end and we had a beautiful sunrise that lit up his whole room while the chaplain was in for his blessing and prayers. We will be briefed on an hourly basis about how he is doing. I will post as often as I can. Unless something changes drastically before tomorrow our little guy will be heading in about 7am. I found a couple of computers at the hospital, and I will put up a post for everyone whenever we hear something tomorrow. Gotta cut this one short and get to bed, we will be on the road real early tomorrow. We met with the surgical assistant today. She went over the whole process again, the pros, and the cons. This is the riskiest part of the 3-step surgical process to "re-wire" the plumbing in Braden's heart. We are scheduled for the 9 hour surgery tomorrow. This however could change at any minute of course. Braden has taken priority over other patients that are here and moved up the list. We feel horrible that this happened to the other families that are waiting because we know how it feels to "hurry up and wait", as my mom would say. By the sounds of it we will be shackin' up with Ronald McDonald for a few days at his house which is right across the street. Posting Comments: Some people have said that they are uncomfortable posting on the blog page. That is OK! You can still email us at petska32@yahoo.com. Feel free to ask questions or whatever you want. I know that a lot of you probably have questions to ask. Please keep us in your prayers. We ask God to help Braden through tomorrow's surgery and that he has no post-op complications. We also God to give us and our family the strength and courage to get through tomorrow and this next month ahead of us. Love to all of you. Thanks again for all of your love, support, and prayers. Braden continues to remain stable and put up a heck of a fight. I find myself standing over him in amazement at how much an 8 lb person can be so resilient. The constant poking and prodding and beeping noises and handling he receives would be enough to drive anyone crazy. Today his breathing tube was removed, because he continues to strengthen in that area. The IV was removed from above his forehead and relocated. These were big moments for Steph and I because we got to see his face without all of that stuff for the first time since Thurs. nite. As the day progressed he did fatigue a little and needed a tube put into his nose for oxygen. I don't know how many new people we met today but it felt like a 1000. There is just so much on the first day in a new hospital, the routines, the elevators, the place to nap, the phones, pagers, finding a vending machine that has Cheetos, etc. It does get a little over whelming, but everyone does simply everything they can to help, which helps so much. Dr. Cava, our new cardiologist, gave us a refresher on the procedures ahead, success rates, expectations for Braden's future for a "normal" life, the risks involved, and the possible unknowns. Is all this scary as hell? YES. But not nearly as scary as walking in as the NICU team is doing everything they can to save your dying kids life. On that note, Steph mentioned Cindy B. from Lutheran in a previous blog, I personally have to say thank you too. I wouldn't be updating you today still if it wasn't for her. Thank you Cindy. Tomorrow is another big day. We meet with the surgical team and discuss their evaluation of Braden's heart and their predictions of the success of the Norwood Procedure on him. They will also be telling us if it will be Weds. or Friday. The surgery is a minimum of 9 hours long by the sounds of it. As I mentioned before, the recovery could be 3-5 weeks also. I should have access to a computer during the day tomorrow, so maybe I could have a post up by late afternoon. Thank you for the continued outpouring of offers to help. It means so much to Steph and I. When we are ready to accept your help or need it we will ask, I promise. It is just so much to juggle right now. Anyways thanks for letting me vent and for reading up on our day. Keep on praying. I'm attaching part of an article I just received from my friend Cara. It explains the success rate of the procedure (Norwood procedure) Braden will be having at Children's in Milwaukee. Herma Heart Center Rated #5 in NationThe Herma Heart Center was rated fifth in the nation for pediatric cardiac care. The center performed more than 700 pediatric heart surgeries and nearly 12,000 total diagnostic, therapeutic and surgical procedures in 2003. In the highly competitive subspecialty of cardiac care, Children's Hospital has the best published survival rate for the Norwood procedure in the world. 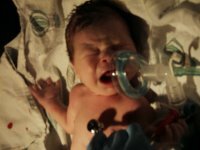 The Norwood procedure is the first of three procedures performed on newborns with hypoplastic left heart syndrome, one of the most complex and fatal heart defects. The center has achieved survival rates of greater than 98% for all cardiac operations for five consecutive years. "We are fortunate that our top-notch care has expanded to include clinics in Neenah, Sheboygan, Racine and Kenosha, Wisconsin, and in Gurnee, Illinois. Our surgical team also travels to Marshfield, Wisconsin, and Loyola University Medical Center in Maywood, Illinois, to perform some types of procedures," said Christensen. The center's outreach programs have allowed families outside of Milwaukee much greater access to this subspecialized care. Good news....Braden had a great night sleep last night (along with his parents) and will be transported today to Children's Hospital in Milwaukee. We just got a phone call from Lutheran General explaining that Children's transport team will be there to pick him up in about an hour. We will then meet with the surgical team and cardiologists that will be working with Braden once he arrives at Children's. We will continue to update you on the latest news. Thank you for your continued support and prayers. Rich and I are so very thankful for all of the prayers we have received for Baby Braden. So many of you have spread the word to many others (people we don't even know) to help pray for Braden and it's definitely working. We, of course, have a long road ahead of us but just the progress he's made in the last 24 hours has been amazing and has lead us to a very positive day today. -All of the small, yet positive steps he's taken today to make him very stable for surgery. Please keep praying for Braden's progress and stability; his strength and courage through this entire process; Rich's, mine, and our family's strength during this time as well. Right now Rich and I are at home getting some much needed rest. We will be heading back down to Lutheran tomorrow. This is when we hope to find out more details about his surgery. We will keep you posted. Braden is making improvements in many areas. In simple terms, he is still stable, blood counts, acid counts, etc. have really turned around since we have been here. Everyone here is so nice and doing an absolutely amazing job. Lung X-rays just came back and it looks as if there is no pnuemonia at this time...but this could still change, and as I said before that would be bad. Being stable like he is, Steph and I are going to go home to get some much needed sleep tonight. We will keep this updated as much as possible. Since our last email with the pic and announcement things have changed dramatically. 1. 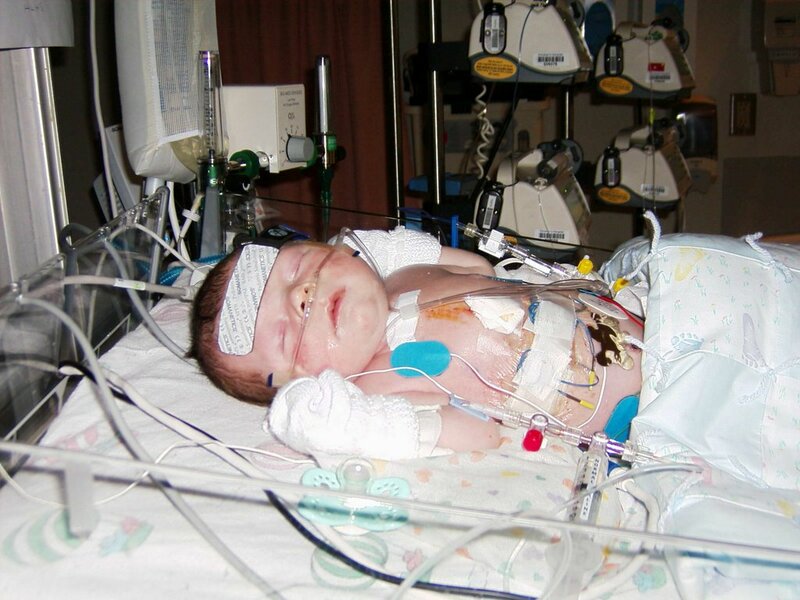 Braden has a very rare heart problem called Hypoplastic Left Heart Syndrome. We have been told that less than 1% of kids are born with this. It is not genetic or anything else, just a horrible fluke. 2. In simple terms; the bottom left side of his heart is very, very small and utterly useless. 3. What this means: This means open heart surgery in the next week. Then another surgery within a 2 month window. Then another one around age 2. The hope is that with these surgeries his blood supply can be rerouted around his underdeveloped left heart chamber. There are large risks with these surgeries as you can imagine, but if all goes well he can live a normal life. 4. Where we stand now: Braden possibly has pnuemonia. If he does this could set back the timeframe when the first surgery could occur and create other complications. He is in good hands and is stable right now. 5. Timeline: If all goes well the first surgery could be in 5-7 days with a 3 -5 week recovery. Based on insurance coverage we may be transferred to Christ Hospital in Oak Lawn or Milwaukee Childrens. We are hoping to go to Milwaukee. We will keep you informed about this. We understand that you want to help us and we thank you for your generosity. We, as parents, feel helpless and lost as to how to help Baby Braden get through this thing. What you can do is pray for our baby as he endures this long journey ahead of him. Please pray for our strength as parents as we join Braden on this journey. As far as us being available we are taking things one day at a time. - If you could please refrain from calling the hospital or our phones that would help us out. It is very difficult to keep up with the messages and voicemails. - We really have nowhere to keep flowers or gifts here but thank you for the thought. - Please be patient, when we know something we will email you.